The Grisha trilogy is one of those books that has developed a large fan base since its release. It's a high fantasy young adult series set in an alternate Russian universe, centered around Alina Starkov, an orphan girl who did not know she was a Grisha (or a human with some sort superpowers) until a near death experience almost took her and her best friend's life. Sounds interesting? Yes, it does. And the fact that a lot of readers loved it made me want to read the books even more. When I started the book, I did not get into it right away. I'm not even sure why. But to be honest, I almost marked it as DNF because I did not really like the way it started. Alina Starkov, the main character was not someone you easily get attracted or drawn to, personality-wise. I also did not find any other character pleasing or interesting enough who will fly me through the pages of the book. Thus, making it a little hard for me to continue the story. Add to that the disastrous reading slump I'm currently overcoming. But I grew patient, took it slow, and convinced myself that I will finish the book even if I only read a chapter or two a day. And about halfway through the book, thankfully, it got a little bit better. Before all the problems with the characters or the story, there's a always one huge obstacle readers face whenever starting a high fantasy series - familiarizing yourself with the places, the map and the foreign or new terms used in the book (or at least that's how I usually feel). 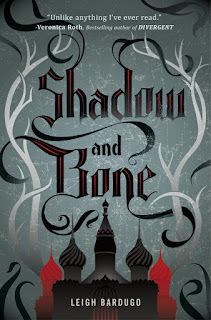 In Shadow and Bone's case, I had a little difficulty getting used to the Russian terms, mainly because I find it hard to pronounce some of them in my head. Getting to know the country of Ravka is a little bit easier because of the map. After a while though, you'll get past all that and finally have a hundred percent focus on the characters and the story. The story itself is interesting, and it makes you ask questions that will tempt you to read on and find out the answers. But it was not captivating enough for me to have read it overnight or 2 days at most. It was actually good, and the pacing was just right. But it did not "wow" me. It did not blew me away. It was fine, but not as fascinating as I expected it to be. I had high expectations, and I was kind of disappointed. One of the main reasons that I blame for me not ultimately being engrossed by Shadow and Bone is the characters. In the story, we meet out three main characters: Alina Starkov, Mal Oretsev, and the Darkling; and some of the minority like Genya, Ivan, the Apparat, Baghra, Zoya etc... The problem I had with the secondary characters is that I did not get to know them well enough to actually care if they are alive or not. The main characters, on the other hand, are just not very likeable in my opinion. Alina was a little boring and flat. I think her extreme desire to be accepted and to belong, plus her feelings for her best friend, overshadowed her personality. It was annoying how she behaves sometimes. Mal's character is overrated. Or maybe I just did not get to know his personality like Alina does to really see the swoon-worthy side of him. And the Darkling. He is mysterious, exudes danger, power and darkness. He's just as expected to be. I honestly don't know how I would rate Shadow and Bone. I liked it, and I'm sure I'll read the next books. But I did like it enough to immediately jump to the next. It was good and interesting, and I am curious as to what happens next, yet I am a little hesitant. But all in all, I think, in one way or another, I still enjoyed reading Shadow and Bone. I hope the second book is better.